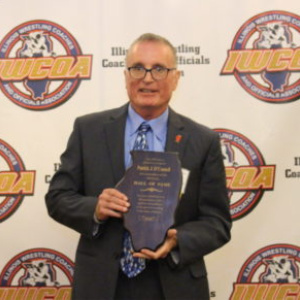 Pat O’Connell, assistant wrestling coach at Joliet Junior College who was instrumental in bringing back the school’s intercollegiate mat program in 2017, passed away Sunday, March 31 after a long battle with lung cancer. He was 62. Patrick J. O’Connell wrestled, and ran track and cross country at Joliet East High School outside Chicago, and at Millikin University in Decatur, Ill. where, as a wrestler, he was a four-time letterwinner. O’Connell was a teacher and a coach for over 40 years, most of that time in the Joliet, Ill. community, serving at Joliet East and Joliet Central high schools before making his mark with the return of the wrestling program at Joliet Junior College after a nearly 30-year absence of the sport. O’Connell launched his coaching career at his high school alma mater in 1979 with Sam Parker … then the coaching team of Parker and O’Connell moved to Joliet Central in 1983-84, and O’Connell began his 27-year association as assistant for the Steelmen under hall of famer Mac McLaughlin. After a three-year stint as head coach at Central, O’Connell served as an assistant to Gardner Coughlen before taking on the assistant coaching position at Joliet Junior College. Pat O’Connell’s obituary lists three high points of his wrestling coaching career: helping guide Joliet Central to the 1985 IHSA (Illinois High School Association) State Wrestling Championship … being inducted into the Illinois Wrestling Coaches and Officials Association Hall of Fame in 2017 … and spearheading the revival of the Joliet Junior College wrestling program in 2017. Founded in 1901, Joliet Junior College is the nation’s oldest two-year public college. JJC had a successful wrestling program from the 1960s into the mid-1980s. In May 2016, the two-year college located southwest of Chicago announced it would be again be offering intercollegiate wrestling. The program returned to the mats starting in the 2017-18 school year … with Pat O’Connell on the staff as an assistant to head coach A.J. Blahut. Visitation for Patrick O’Connell will be Friday, April 5, 2019, from 2-8 p.m. at Forsythe Gould Funeral Home, 507 S. State St., Manhattan, Ill. Mass of Christian Burial will be at 10 a.m. Saturday, April 6, 2019, at St. Mary Nativity Catholic Church, 702 N. Broadway St., Joliet, with Father Jerome Kish officiating. There will be no procession to the church from the funeral home. Interment will be at Woodlawn Memorial Park, Joliet. In lieu of flowers, donations made in O’Connell’s name may be made to Joliet Area Community Hospice, 250 Water Stone Circle, Joliet, IL, 60431 or to Takedown Cancer at www.takedowncancer.org.